To provide the high-quality lawn service residents know us for, Evergreen Lawn Care relies on top-of-the-line techniques and tools, including commercial-grade mowers, trimmers and weed eaters. Our insured company is a leading provider of residential and commercial lawn care. These are some of the questions our clients most commonly ask about our landscaping services. If you have additional questions, contact us today! Evergreen Lawn Care is a fully insured company. Our staff is comprised of friendly, professional lawn care and maintenance experts who are dedicated to providing clients with reliable landscaping service. When you schedule a service with Evergreen Lawn Care, one lead and one to two helpers will work on your property. Our scheduling staff will ensure that the same team members assist you every time. This will allow them to get to know your preferences and your property’s requirements. What are the best days of the week to schedule services? Our hours of operation are 7:30 a.m. to 6 p.m. Monday through Friday. For residential and commercial clients, we recommend scheduling lawn care and maintenance services early in the week, such as on Monday, Tuesday, or Wednesday, to ensure that there is enough time to make any adjustments needed and have the landscape looking great by the weekend. Clients are scheduled according to the area of Gainesville where they live. When they call us for their first appointment, they assigned one day of the week as their service day, which is permanent unless otherwise communicated. Our clients enjoy having a fixed day because it allows them to know when the lawn care specialists are going to arrive and make any necessary preparations, such as keeping pets inside, unlocking gates, and removing any items that might get in the way from the serviced area. For summer lawn care, we recommend watering your lawn between 5 a.m. and 9 a.m. every day for about 20 minutes to 30 minutes per zone. On extremely hot days, water it again around 7 p.m. to ensure it receives enough irrigation to look great all season long. At Evergreen Lawn Care, our landscaping experts are trained to trim and prune shrubs of all varieties, shapes and sizes. Well-maintained bushes and hedges will significantly improve the overall appearance of your yard. Contact us today to schedule pruning services. Pruning is crucial for the health, aesthetics and longevity of plants. Ideal pruning times depend on the types and variations of shrubs you have. Evergreen and spring-flowering shrubs should be pruned in late spring to early summer. Other varieties can be lightly pruned at any time of the year. When pruning, we remove all dead, broken, diseased or otherwise problematic limbs from the shrub, cutting as close to the stem as possible. In many cases, this is enough. If further pruning is required, we do it to train and shape the plant in a manner that best coincides with its natural growth pattern. While some shrubs require extensive pruning, most Florida-native species only require basic maintenance. For questions about pruning specific shrubs on your property, contact Evergreen Lawn Care. At Evergreen Lawn Care, we assist the owners and managers of businesses and properties by providing commercial landscaping services. A well-designed and aesthetically pleasing landscape can give customers a good first impression and be as beneficial to a business as having a professional, detailed website. For more information about our maintenance services for commercial grounds, contact us today! Do you catch or recycle clippings? We do not catch or bag clippings. 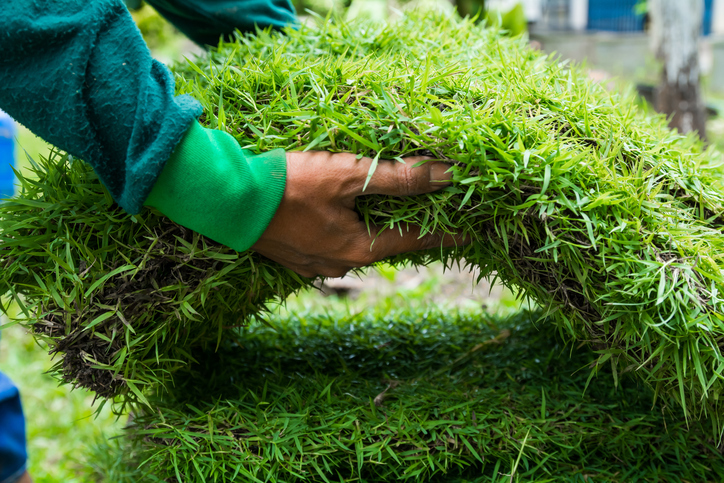 The clippings are mowed as much as possible to reduce the chance of thatch building up on a client’s turf. How is a lawn helpful to the environment? Natural, professionally kempt grass lawns are sustainable decorations that contribute to environmental health and stability. Lawns take in carbon dioxide from the air and return oxygen on a regular basis. Since lawns are most efficient at producing oxygen when they are healthy, scheduling maintenance services with lawn care professionals is important. Besides looking nice, mulch is good for your yard. Residential and commercial flower beds should be covered with 3 inches to 4 inches of mulch to protect them. Adding mulch can reduce the appearance of weeds, protect roots from extreme temperatures, and preserve moisture in the beds. What types of mulch do you offer? To meet your needs, we offer a variety of mulch, including naturally dyed, pine bark, cypress, pine straw, and rubber playground mulch. Contact us today to schedule mulching services for your residential or commercial landscape. What are some of the most important things a lawn in Florida needs? Florida lawns require specific care to remain healthy. This includes mowing them at 3 inches with a sharp blade, hydrating them with deep and infrequent irrigation, and providing them with core aeration and 3 pounds to 4 pounds of nitrogen once a year. Landscaping experts with Evergreen Lawn Care can help you achieve and maintain a beautiful, healthy lawn year-round. Generally, we recommend irrigating lawns before 10 a.m. or after 4 p.m., when temperatures and wind speeds are at their lowest to prevent losing moisture due to evaporation. Keep in mind the watering regulations pertaining to Alachua County, which may differ from other counties’ rules. Contact Evergreen Lawn Care for irrigation guidelines tailored to your property. Our lawn care professionals know that each type of grass has specific height requirements. Below are the types of grass most commonly found in North Central Florida. Bahai grass (also known as field grass) can be cut as low as 2 inches. Centipede grass can be cut from 2 inches to 3 inches. Zoysia grass can be cut from 2 inches to 2 ½ inches. 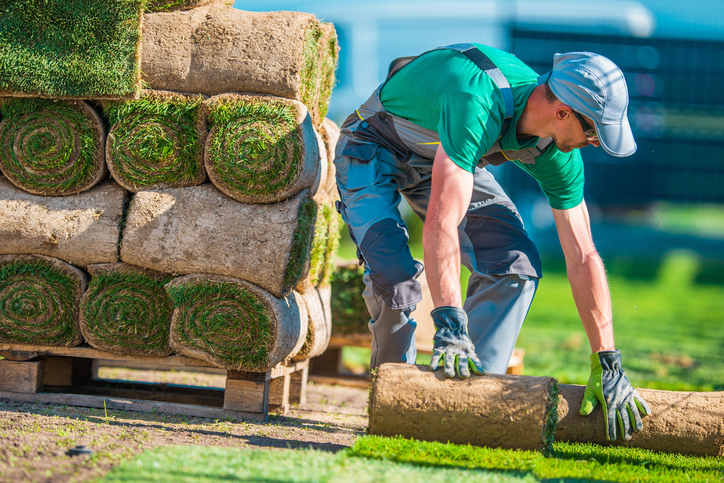 St. Augustine grass should be cut from 3 ¾ inches to 4 ½ inches. Can landscaping really improve my property's resale value? Hiring a professional lawn care company such as Evergreen Lawn Care to properly maintain your landscape is one of the best ways to increase curb appeal and increase your property’s resale value. Our landscaping experts will work with you to determine which services would best suit your property and impress potential buyers. For stunning landscaping, residents rely on, call Evergreen Lawn Care today! Can you pay special attention to my property before a big event? If you have a big event coming up, contact Evergreen Lawn Care with plenty of notice so we can adjust our notes with details of what you require. If the event falls on a non-service week, we will do our best to fit you in for extra service. Any extra services not included in your service plan will be billed accordingly for work performed. How long does it take to complete a landscaping project? A number of factors will determine your project’s deadline and timeline, including scope of work, materials required, weather and budget. Nonetheless, we will put all hands on deck to complete the project by the set date.